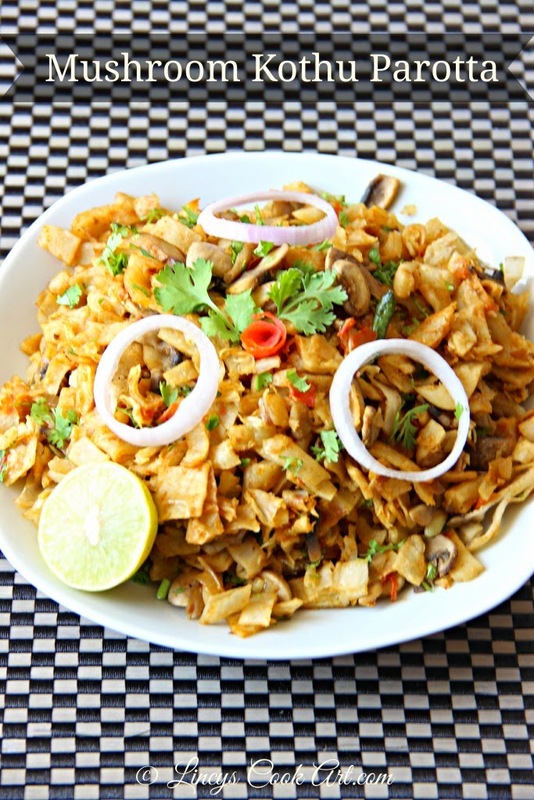 Kothu Parotta is a street food served during evenings to late nights. Bus stands and the by pass road's night shops are very special for this dish. But nowadays it has been served in restaurants also by incorporating varieties like Paneer, Mushroom in it for the vegetarian versions. It is easy to make tasty dish. Does not require any side dish. 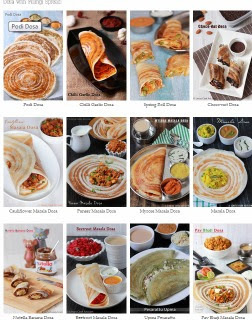 It has several variations veg (Mushroom, Paneer)and non-veg (Chicken, Egg) versions. Left over parottas can be used to make this dish in a fresh make over. Super tasty filling dish. It can be eaten as Breakfast or Dinner or even Snack. What time you eat is your choice but whenever you eat, you will feel to eat more. Yummy! Chop the mushroom in to thin slices. Cut the parottas using kitchen scissors or chop them using chopping board or tear them using hands. Heat oil in a broad pan and add the onion, green chillies and curry leaves. Once the onion cooks and become translucent add ginger and garlic and cook for a minute till raw smell leaves. Now add the tomatoes and salt; cook well. When the tomatoes becomes mushy add the mushroom and salt and cook for a minute or two till water starts to oozes out from mushroom. Add the masala powders turmeric, chilli powder, coriander powder and garam masala powders. Mix well and cook for thirty seconds and make like a thick gravy. Now add the chopped parotta and cook in that gravy for a minute or two till the gravy coats well in the parotta pieces. Do not allow to dryout the parottas. If you feel too dry sprinkle little water and cook. So that the parotta will be soft and slightly moist. Sprinkle coriander leaves and serve hot. Serve with chopped onion/ onion rings. You can serve with Onion Raitha too. Perfect for light lunch, love the simple dish. kothu porotta and mushrooms both my fav. Looks yumm.. Delicious and yummy kothu porotta.. Delicious & love the combination of mushroom with porotta . That plate of kothu parotta is torturing me..very tempting and my mouth is watering here.